7 Gear Box Sizes from 1.33 to 3.25"
The HDR Series worm gear reducers are used in low to moderate horsepower applications to reduce speeds and increase torque. Worm gear reducers are available in direct or indirect drive, direct drive models are 56C or 145TC flange mount with either right, left or dual output shafts or a hollow bore output. 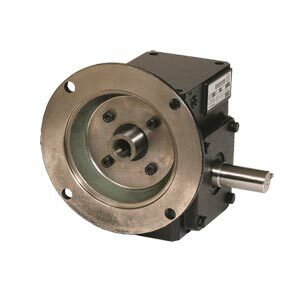 The indirect drive models are shaft input-shaft output boxes for use with sprocket or pulley drive systems. They provide an effective low cost solution to speed reduction and increased torque, with higher tolerances for shock loading than helical gear reducers. In order to select a gearbox speed reducer, you will need to determine the required torque and service factor for the application. Click on "Specs" above for a table that will assist in determining the service factor. For service factors above 1.0, multiply the required torque by the service factor. Note: Mounting base comes complete with bolts.